It’s well established that any industry conference is a chance to rub elbows, learn a few things, and maybe generate a little new business. That was one of the central activities at Ticket Summit in July, but for the United States Minority Ticketing Group (USMTG), it was an opportunity to do more. A non-profit business league operating within the ticketing industry, the USMTG wanted to engage with fresh faces to grow its membership, and take an active role in giving back to the community. On both fronts, the trip to Las Vegas was a smashing success, according to the group’s leadership. Developed in reaction to the lack of diversity present in the ticketing industry and to give those of color operating in it a united voice and greater opportunity, the USMTG’s stated mission is to embrace those who have not always been included in traditional entertainment associations, support its membership and promote the highest standards of conduct in the business. Its leaders were active on the floor throughout Ticket Summit, making sure to make inroads with all attendees, with a particular attention paid to those of color who might be interested in becoming a part of the organization. In addition, Scot X. Esdaile, a principle member of the USMTG and President of the Connecticut State Conference, NAACP, was one of the conference presenters, sitting on the Legislative Impact panel and providing his insight on the industry. A culminating moment for the USMTG happened on Wednesday evening, when the group held a reception at SushiSamba, near the convention center itself. Current and prospective members mingled, then celebrated as the group awarded Allen Shelton Jr. its first ever scholarship. Shelton’s academic and athletic accomplishments were highlighted in a speech by former Nevada State Rep Wendell Williams, a Las Vegas leader who for 35 years has led the Martin Luther King Parade Committee and was the first African-American elected Speaker of the legislature in the state. The day after the reception, the USMTG, led by Vice President Mike Freeman, gave back to the local community once again, sponsoring a USMTG Community Day in concert with the Nevada Partnership for Homeless Youth. 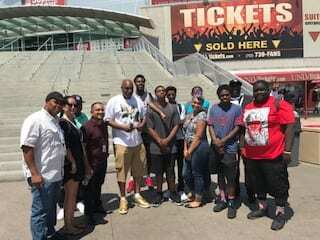 Some 30 kids joined USMTG members at the Thomas and Mack Arena for a full day of NBA Summer League action, where they got to watch hoops and enjoy some snacks with the tab picked up by USMTG members. “It was just great to see kids in that situation get to be kids,” says Freeman. “They were just on such a high from getting to be a part of that kind of thing. 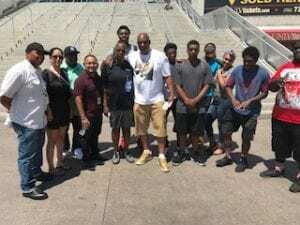 In keeping with the group’s educational goals, Freeman said the group was in contact with representatives of local organizations and the NBA to see about linking interested kids with internship opportunities, in order that they might learn the business side of the game. That work will be ongoing, part of the group’s hopes for leaving a positive impact wherever it goes.